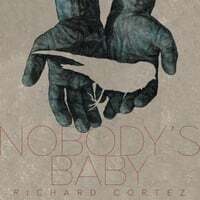 “Nobody’s Baby,” the second single off Richard Cortez’ upcoming EP, The Welder & The Lark, marries subtle doo-wop nuances and a lone guitar with Cortez’ warm, crooning baritone voice. A humble, earthy percussion section drives the rhythm on this moody groove using sampled, natural sounds generated by the guitar itself and a classic finger snap. With swirling, layered background vocals by fellow queer singer-songwriter, Boy Radio, and an earnest vocal performance by Cortez, “Nodody’s Baby” is a genuine attempt to merge openly gay lyrical content with a genre of music written before the gay rights movement began.